Picture - First YC-15 prototype conducting flight testing, accompanied by an F-4 Phantom II. The YC-15 was McDonnell Douglas' entrant into the U.S. Air Force's Advanced Medium STOL Transport (AMST) competition, to replace the C-130 Hercules as the USAF's standard STOL tactical transport. 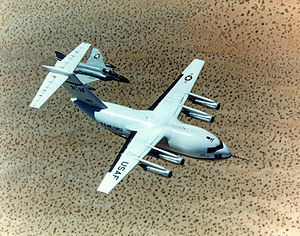 In the end neither the YC-15 nor Boeing YC-14 was ordered into production, although the YC-15's basic design would be used to form the successful C-17 Globemaster III. In 1968 the USAF started work on a series of prototype proposals, which would lead to both the AMST project and the Light Weight Fighter. The official RFP was issued in January 1972, asking for operations into a 2,000 feet (610 m) semi-prepared field with a 27,000 lb (12,000 kg) payload and a 400 nmi (740 km) mission radius. For comparison, the C-130 of that era required about 4,000 ft (1,200 m) for this load. Proposals were submitted by Bell, Boeing, Fairchild, McDonnell Douglas and the Lockheed/North American Rockwell team at this stage of the competition. On 10 November 1972, the top two bids from Boeing and McDonnell Douglas were selected. The companies were awarded development contracts for two prototypes each. McDonnell Douglas' prototype was designated YC-15. McDonnell Douglas's design incorporated a supercritical wing, the result of NASA research carried out by the already famous Richard Whitcomb. This wing design dramatically lowers transonic wave drag by as much as 30% compared to more conventional profiles, while at the same time offering excellent low-speed lift. Most contemporary aircraft used swept wings to lower wave drag, but this led to poor low-speed handling, which made them unsuitable for STOL operations. The design team also chose to use externally-blown flaps to increase lift. This system uses double-slotted flaps to direct part of the jet exhaust downwards, while the rest of the exhaust passed through the flap and then followed the downward curve due to the Coandă effect. Although the effects had been studied for some time at NASA, along with similar concepts, until the introduction of the turbofan the hot and concentrated exhaust of existing engines made the system difficult to use. By the time of the AMST project, engines had changed dramatically and now provided larger volumes of less-concentrated and much cooler air. For the YC-15 four small engines were used, versions of the Pratt & Whitney JT8D widely used on the Boeing 727 modified with an extra fan stage at the rear of the engine to increase the cool air flow. The YC-15 "borrowed" from other McDonnell Douglas aircraft, with its nose gear coming from the DC-8 and the cockpit from the DC-10. Picture - The C-17 Globemaster III, derived from the YC-15, shares a similar configuration, except for having swept wings. Two YC-15s were built, one with a wingspan of 110 feet (#72-1876) and one with 132 feet (#72-1875). Both were 124 feet (38 m) long and powered by four Pratt & Whitney JT8D-17 engines, each with 15,500 lbf (68.9 kN) of thrust. The first flight was August 26, 1975. The second prototype followed in December. They were tested for some time at McDonnell Douglas as the Boeing entry was not ready until almost a year later. In November 1976 both designs were transferred to Edwards Air Force Base for head-to-head testing, including lifting heavy loads like tanks and artillery from dirt airfields at Graham Ranch, off the end of Runway 22. The YC-15s completed a 600 hour flight test program in 1977. By this point the seeds of the AMST program's demise had already been sown. In March 1976 the Air Force Chief of Staff Gen. David C. Jones asked the Air Force Systems Command to see if it was possible to use a single model of the AMST for both strategic and tactical airlift roles, or alternately, if it was possible to develop non-STOL derivatives of the AMST for the strategic airlift role. This led to a series of studies which basically stated that such a modification was not easy, and would require major changes to either design to produce a much larger aircraft. Both the YC-14 and YC-15 met or exceeded the AMST specifications under most conditions. However, the increasing importance of the strategic vs. tactical mission eventually led an end of AMST program in December 1979. Then in November 1979, the C-X Task Force formed to develop the required strategic aircraft with tactical capability. The C-X program selected a proposal for an enlarged and upgraded YC-15 that was later developed into C-17 Globemaster III. After the flight test program, the two aircraft were stored at the AMARC, located at Davis-Monthan Air Force Base. One was subsequently displayed at the nearby Pima Air & Space Museum. 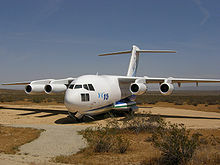 AMARC's YC-15, 72-1875 (the first one built), was later returned to flying status by McDonnell Douglas in 1996, and resumed flying in 1997 for the C-17 program. After an engine failed, the aircraft was deemed too expensive to repair and was returned to storage, sitting for a number of years at the Boeing facility at Air Force Plant 42, in Palmdale, California, before being moved to back to Edwards, where it is now on display at the Air Force Flight Test Center Museum's "Century Circle" display area, just outside the base's west gate. Green, William. The Observer's Book of Aircraft. London. Frederick Warne & Co. Ltd., 1976. ISBN 0-7232-1553-7.